Bundesliga | Pierre-Emerick Aubameyang: "I have something in mind for my 100th goal, but it's a surprise"
Pierre-Emerick Aubameyang: "I have something in mind for my 100th goal, but it's a surprise"
Pierre-Emerick Aubameyang has warned Borussia Dortmund fans to keep their eyes on him should be break the 100-goal barrier in the Bundesliga during Sunday’s Matchday 18 encounter with Wolfsburg. In an exclusive interview with bundesliga.com over the winter break, Aubameyang discusses his plans for his 100th goal, the moment he won the Bundesliga's Torjägerkanone last season, his range of languages and how special it is to play for Dortmund. 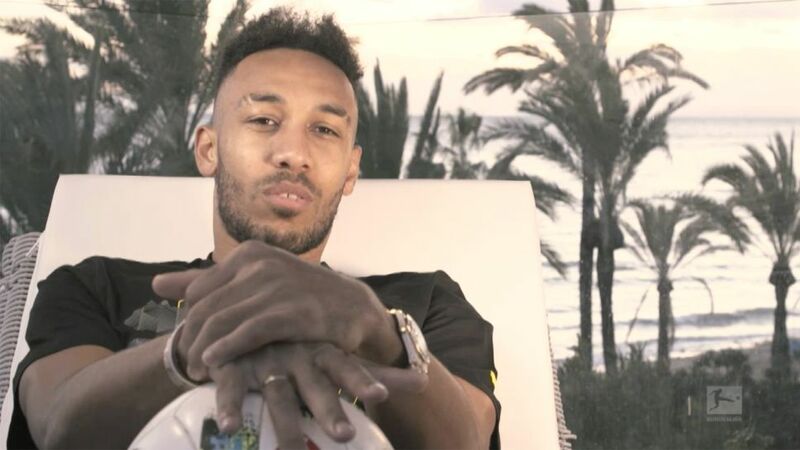 Watch: The full interview with Pierre-Emerick Aubameyang! Aubameyang has found the net 13 times this season, taking his tally in the German top flight to 98. The Gabon international scored three times in his last four league outings before the winter break, and if he quickly strikes the same rich scoring vein, Dortmund supporters could be in for a show if he reaches the milestone at the Signal Iduna Park this weekend. "It's all kicking off again, and hopefully we can make a good start with a home win," Aubameyang told bundesliga.com at Dortmund's winter training camp in Spain. "I'm closing in on 100 league goals, and I've something in mind for when I get there, but it's a surprise." Should Aubameyang find the net, he could close the two-goal gap between himself and the league's current leading scorer, Robert Lewandowski, who looks set to miss Bayern Munich's Rückrunde opener at Bayer Leverkusen on Friday through injury. The pair have gone goal-for-goal over the last two-and-a-half seasons with Lewandowski lifting the Torjägerkanone in 2015/16 only to see his former Dortmund team-mate pip him to the honour — and break his record for goals in a single Bundesliga season by a foreign-born player — last term with 31. "It was an extraordinary moment; I couldn't hold back the tears. I put a lot of work into fulfilling that dream, of finishing top scorer one day. And it's all the harder when you're up against Robert Lewandowski," explained Aubameyang, who became the Bundesliga's highest-scoring African with his Matchday 15 goal against Werder Bremen. "For me, as an African player, it's something special. I hope I can score a lot more goals." If he does so, the former Lille and Saint-Etienne man will only endear himself still more to those dressed in yellow and black, and who flock in their thousands to see him perform for their beloved club. "It's something very special to be here. The whole city is mad about the club," said the 28-year-old, who has been in Dortmund since 2013. "The fans are like a solid wall behind us, pushing us on until the very last kick of the ball. It’s simply wonderful." But there is more to Aubameyang than just the goals. With a Spanish mother and Gabonese father, the striker was blessed with the chance to speak a host of languages. Besides his native French, he boasts Italian, Spanish and English. "It’s not easy, you know," says Aubameyang when asked about the task of controlling so many dialects. "Sometimes I speak a little bit of Spanish, then I'll change because my father asked me something in Italian and then I have to speak a little bit of German, maybe English. So it’s funny." Borussia Dortmund kick-off their 2018 Bundesliga campaign by hosting Wolfsburg on Sunday. Watch: All of Aubameyang's first 95 Bundesliga goals!